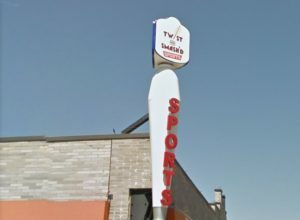 Twist and Smash’d (from here on out T&S’d) was originally born out of a desire to sell some cool twisted potatoes and smashed burgers, and has since expanded to a location where they have tons of taps and tables, an indoor bocce court, and plenty of TVs to serve as a go-to spot for watching the sporting event of your choice. The interior is fairly large, especially considering that it’s in NYC, and I would daresay it felt a bit cavernous. While the bar is ringed with over a dozen TVs and the bocce court was filled with lots of people having fun, the rest of the restaurant felt a bit bare in comparison. 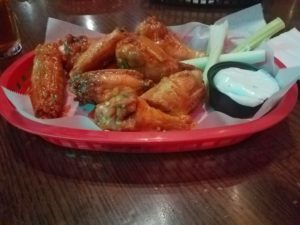 The overall vibe was very familiar to me, and I can only describe it as having the feeling of a chain restaurant in a small town that attracts both a college crowd and a severely local one. This isn’t necessarily a bad thing, just a wildly specific thing. Of course the most featured item on their menu is the twisted potato, which is basically a skewered spiral cut potato seasoned and cooked and from what I’ve seen of the reviews people seem to love it (we did not get it on this visit, but I might go back for it, it looked tasty.) Second is their burgers, all of which ostensibly come on a bun that has had their logo toasted directly onto the bun. Other bar fare is on offer, including mac and cheese and nachos, some salads, even a steak is in the mix. They definitely lean more on being a restaurant than a bar. 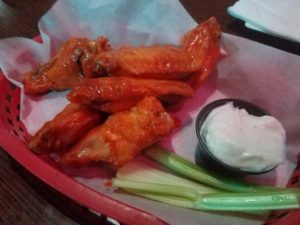 PPW is pretty standard for mid-range NYC wing joints, starting at $1.33 for 6 wings and dropping to roughly 87 cents for 80. I was running a crappy amount of late due to both poor planning and train traffic, so my cohorts ordered some fried pickles while they waited for me, and they arrived a couple minutes after I got there. They were pretty darn tasty. 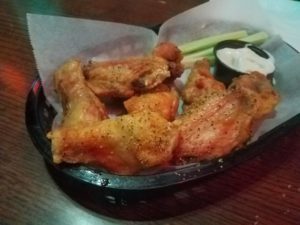 But for wings, which is what we’re all here to hear about, we got the sampler that consists of eight wings each of four different flavors. Our flavors were Spicy Buffalo (duh,) Thai Sweet Chili, Lemon Pepper, and Fusion. JZ, who has at times been one of our harsher critics, said that these were “slightly sweet, not spicy” and “not [a] strong flavor.” While he said he “didn’t like it at first, [it] grew on me.” VC agreed with the first two sentiments, also adding “uninteresting” to the list. The best thing I can say about this flavor is that it did a decent job of tasting like sweet chili, but it was kind of a sweet mess without much to add, and literally none of the chili kick one would expect. It’s decent at best, but I wouldn’t run back for more, which I guess is why we have a 2/5. MG was the first to dip into this dry rub, saying that it had a “great crisp and lemon flavor throughout.” VC agreed that there was a “clean lemony taste. Unfortunately the lemon wasn’t evenly distributed across the wing.” It seemed to all of us that MG got the prime wing of the bunch, as the rest of these seemed to be more pepper than lemon overall. It wasn’t until I tried a second one of these that I got any lemon flavor. Like any dry rub, it helped keep the skin crispy and the chicken juicy, but the lack of coverage and consistency and the just OK flavor drops these to a 2/5. 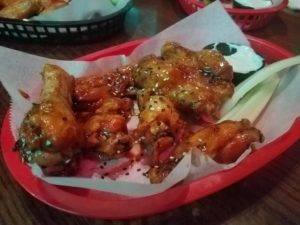 While the Spicy Buffalo was OK, a lack of imagination, flavor, and in some places even the lack of sauce on these wings doesn’t conjure any reason for me to give them anything better than a 2/5 for the sauce overall. I’m actually on board with the wings they used here. The were middling in size, but they were cooked with competency, the skin had the capability of attaining a crunch while the meat remained moist and tasty inside. They didn’t seem to absorb much flavor from the sauce (with the exception of the dry rub) but tasted well enough on their own. The only thing I can really find at fault with them was the drumette to flat ratio, which was about 70/30, and as I’ve made clear a few times before I’m a flats guy all the way. It was a very middle of the road wing overall, which always goes the way of a 3/5. T&S’d seems to have cultivated a brand around their burgers and potatoes, and while I may go back there again to check them out, I probably won’t be getting the wings. It’s a decent enough wing at a decent enough price, but their sauces, their presentation, and really the whole package was just unimpressive. Have I become jaded by all the wings I’ve eaten in the last five months? I really suspect this sometimes, but my co-wreviewers seemed to be just as unimpressed as I was. 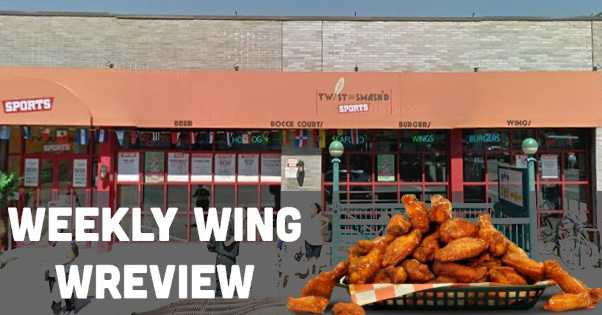 They aren’t serving a bad wing, but for an establishment touting their wings as the best in town, I really wish they had at least come to play instead of just showing up to the game. The Hot Take here is a 2/5. Not a whole lot to add this week, except i would like to admit that I yanked the images for the exterior from Google streetview (My apologies to Vicki who I had asked to get some additional shots for me that I didn’t use.) I also want to put two calls to action here. Do you have your own ideas about something we should be covering on Maxfun.nyc? More importantly, would you like to write about something you love, something you do, or anything else you can stretch to fit into the umbrella of something you would like to see more of on this site? We would all love to see more stuff on here, and if you have any ideas you can send them directly to Jeremy@maxfun.nyc, because he’s a really cool guy and he’s brought this whole thing into being and I love watching it grow and thrive. Secondly, and I know it’s already at the bottom of every wreview, but I wanted to put it up her in bigger font: if you want to be part of the WingSquad, the elite group of members who get to run around the city and eat chicken wings with me, send a message to wings@maxfun.nyc or find me on Facebook and let me know, I’m always happy to have more carnivores (and occasional herbivores for some veggie wings) on board.